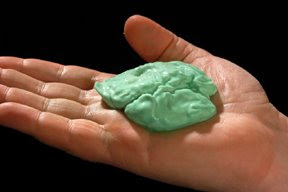 In our most recent program, “You’ve Been Slimed”, Seth & Molly make slime in the SETI kitchen with guest Tori Hoeler. Here’s how: Fill one cup with water and add a spoonful of the Borax powder and stir it up. Fill another cup with about 1/2 inch of glue. Add three tablespoons of water to the glue and stir. Add a few drops of food coloring and stir again. Add two tablespoons of the Borax solution and stir well and voila! You’ve been slimed! Of course, for the above photo, I’m the one forced to pose with the slime. It was kind of slick, viscous, sticky. I wish there were a single word to use to describe it. Blimey! I’m stymied.